The Accessories Unlimited (AU) KVAN stainless steel hood channel CB antenna mount will work with most Ford, Dodge, and other vans with tilted hoods. Some models will have an existing bolt under the hood that will allow you to install the mount without drilling. For any models that do not have a usable bolt, you will have to drill holes to install the KVAN mount. 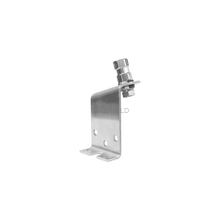 AU KVAN Stainless Steel Hood Channel Mobile Antenna Mount for Vans is a quality made CB antenna mount that will accept any antenna that has ferrules threaded for 3/8x24. Accessories such as antenna shock springs or quick disconnects work equally well with the AU KVAN antenna mount. Whether you want your high quality two-way radio antenna mount port or starboard the Accessories Unlimited Van mount will accommodate mounting on the driver or passenger fender with equal ease. Antennas short or tall are no problem for the AU KVAN mount, this rugged antenna mount can rigidly support antennas up to 5 feet tall. The included antenna stud mount provides ease of attachment for your ring and terminal coaxial cable. Accessories Unlimited CB antenna products are an up and coming brand that demonstrates reliable quality in the market. Install an AU mount for your next CB antenna- you won't be disappointed! The Accessories Unlimited KVAN hood channel van mount is sturdy enough that it can support up to 5 foot antennas safely. For 4 and 5 foot antennas we recommend attaching the mount with multiple bolts or installing additional screws for added support. The KVAN mount accepts 3/8 x 24 threaded CB antennas. A CB antenna spring is recommended for this mount. CB World has compiled a complete information guide on selecting the right spring for your antenna, available in our Help Center. A CB coax with lug connectors (hoop connectors) is recommended for the hood channel van mount. For the easiest install possible, use of a Firestik CB antenna coax is recommended.